In 1916, New York City passed the first zoning law in the United States—an innovation that was copied by aspiring cities around the country and around the world. Mastering the Metropolis: New York and Zoning, 1916-2016, a new exhibit at the Museum of the City of New York, looks at how one hundred years of zoning has shaped New York City and continues to drive the city’s future. To learn more about how zoning has affected public space in New York, PPS caught up with the show's Associate Curator Eric Goldwyn. PPS: How has zoning affected public spaces in New York over the years? Eric Goldwyn (EG): Since 1916, zoning regulations have addressed open space. The entire logic of Area Districts—one of the three districts created by the Zoning Resolution (see Article IV)—was to ensure that developers didn’t erect buildings that occupied 100 percent of a building's lot. While this regulation did prevent intensive private development, it did nothing to address public space. The 1961 zoning overhaul, however, did provide incentives for the construction of Privately Owned Public Spaces (POPS). These spaces are the plazas that William H. Whyte documented in The Social Life of Small Urban Spaces, which we include in the exhibition. It also includes indoor public spaces, known as atria. These spaces abound in midtown. In addition, the rules governing these spaces have changed over time. After Whyte’s analysis, the City Planning Commission issued new design guidelines to improve these spaces, another object we include in the exhibit, so that they were more than wind-swept expanses of pavement. Opposing Street Walls. Rob Stephenson,Third Avenue between 55th and 56th Streets, Manhattan, 2016. Courtesy of the photographer/Museum of the City of New York. PPS: What kinds of objects and images are in the show that might be exciting to our audience of placemakers? EG: Along with including the Whyte video in the exhibition, we also have original Hugh Ferriss renderings, which are incredible. Any urbanist who has followed zoning debates for more than a few months will eventually come across Ferriss’ 1922 renderings of what was possible under the zoning code. We feature a very abstract looking drawing that looks like something out of Fritz Lang’s Metropolis or Bjarke Ingels’ Via 57 and then a more realistic image that looks like the art deco buildings of that era. It’s very clear that the regulations really shaped the skyline. Instead of “form following function,” we argue that "form followed zoning." We track the debates over open space and access to light and air from pre-1916 to today so I think people interested in placemaking will find the exhibit speaks directly to them and their interests. New York’s relationship with open space has changed over the last 100 years, and we chart those changes carefully. We also have great zoning maps, documentary photographs of New York from different eras (one of my favorites is a photo of SoHo from 1970), great photos by Rob Stephenson of New York today, and a humorous illustration of the growing size of the Zoning Resolution. We encourage all visitors to take a picture measuring themselves against the number of pages in the current Resolution. If anyone is taller than the number of pages in today’s code, we will give him or her a very special prize. PPS: The street is one of our most vital and ubiquitous public spaces. How does zoning in New York today affect the feeling and liveliness of the buildings that abut our sidewalks? EG: The very first thing visitors will see when they arrive at the exhibition is a picture of a street—68th Street between 2nd and 3rd Avenues specifically. We chose this street because you can see the effects of zoning through history play out on this single block. The block contains an apartment building from 1929 with a setback, a hallmark of the 1916 regulations, a row of houses built in the 1880s that do not conform to zoning, and a tower fronted by a plaza built after the 1961 overhaul. Zoning plays a critical role in the vitality and design of streets. The 1916 code, for instance, regulated the height of buildings according to the width of streets and avenues. In New York, avenues tend to be 100 feet wide and streets are 60 feet wide. This means that buildings on avenues are taller than those on the streets. In addition, the regulations allowed the first 100 feet in from the corner to follow the regulations of the avenue rather than the street. 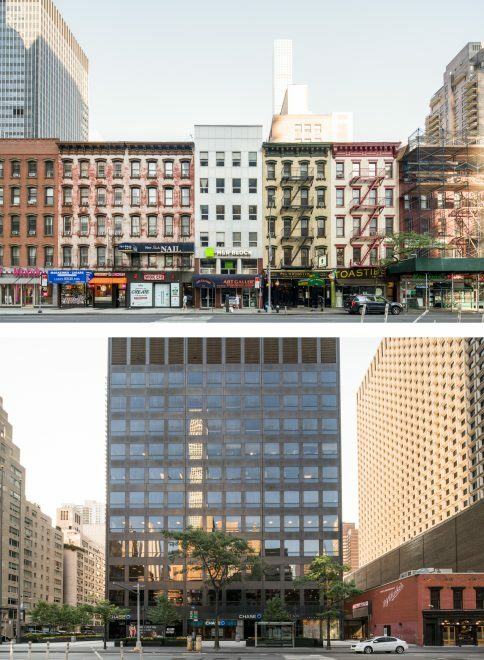 As a result, New York’s typical bookend style of streets, taller buildings on the corner and shorter buildings between, is a product of the code. With the 1961 overhaul, the typical street urbanism of New York was exploded. Instead of buildings crammed together like a healthy row of teeth, we pushed buildings back from the property line and encouraged open spaces that eroded the iconic streetwall described earlier. The strip of 6th Avenue south of Central Park looks nothing like the New York of the 1920s or 1950s. The exhibit doesn't take a strong normative view on these things, but we do provide the evidence for one to draw one’s own conclusions about what the ideal city looks like. Bonus: Paul Newman explains how "form follows zoning" on the Upper East Side—for better or worse—in this video from 1986.